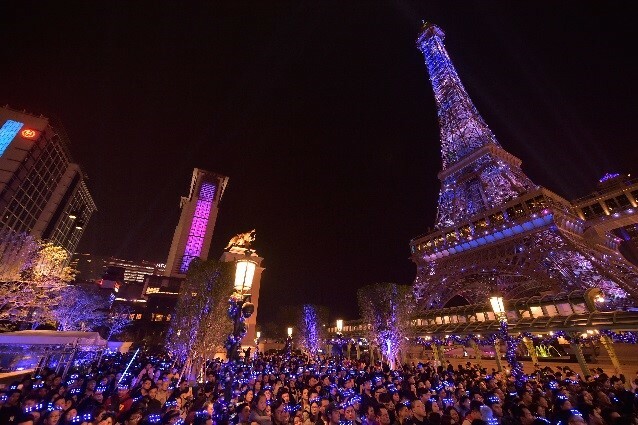 The Venetian® Macao and The Parisian Macao will bid farewell to 2018 and welcome 2019 together with end-of-year revellers at spectacular New Year’s Eve outdoor countdown celebrations from 8:30 p.m. on Dec. 31. 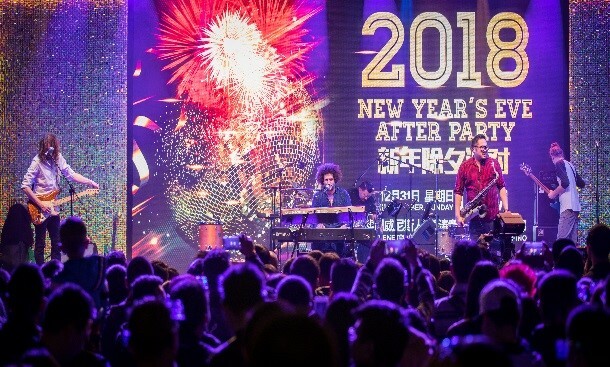 The Venetian Macao lagoon area will feature live music with Andy Frasco & the U.N. direct from the USA, plus Fully Funktional party band from the UK and a spectacular countdown and fireworks show at midnight. 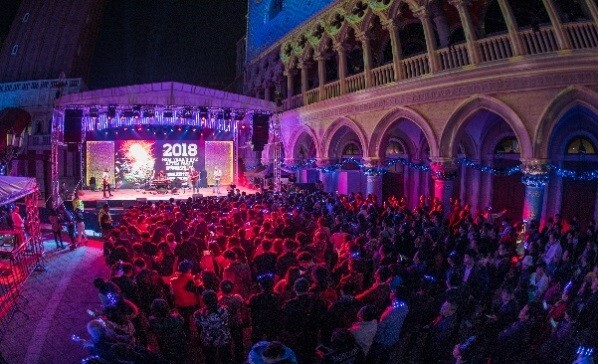 DJ Gie, other performers and dance acts will continue to rock the crowds at The Venetian Macao right through until 1 a.m.
For the first time ever partygoers will be able to join in the fun at Le Jardin garden opposite The Parisian Macao Eiffel Tower, where entertainment will include live performances from Rubberband, Terence Siu Fay and house band Blue Note. A ceremony and activation moment will take place to officially open Le Jardin. 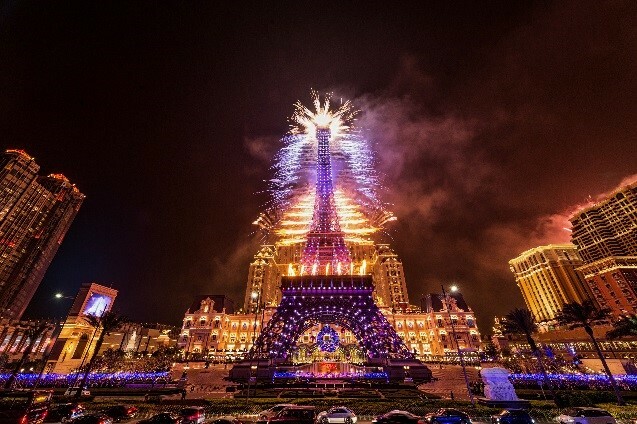 President of Sands China Ltd. Dr. Wilfred Wong will officiate at the event, and together with singing superstar Jane Zhang launch the beautiful French-themed garden opposite to The Parisian Macao where also is the perfect vantage point to watch the fireworks show at midnight. Entertainment from DJ LuLu and other dance acts will continue until 1 a.m. Visitors will be able to enjoy food and drink refreshments and giveaways throughout the night, including special 2019 LED-lit glasses, perfect for photos and selfies. Equally unmissable is the 2019 JSTV Countdown Concert, featuring stars including Chris Lee, Zhang Jie, Jolin Tsai, Jane Zhang, William Chan, G.E.M., Wakin Chau, Pu Shu, Li Ronghao, Mao Buyi, Silence Wang , Julius Liu and others. Date and Time: Dec. 31, 2018 (Mon) 6:45 p.m.
With free outdoor live entertainment, fireworks show, 2019 JSTV Countdown Concert and special celebrity guest appearances throughout the night, Sands Resorts Macao will be the ultimate festive destination to be this New Year’s Eve for both locals and visitors. Sands Resorts Macao and Sands® Macao have launched delicious New Year dining promotions, offering guests a wonderful range of festive feasting. Promotions and special menus are available at eight award-winning restaurants for guests to enjoy seasonal celebrations. Diners can also enjoy the majestic firework and the countdown events after having a holiday feast at Sands Resorts Macao. For more information about New Year celebration menus across Sands Resorts Macao and Sands Macao this holiday season, please go to: en.sandsresortsmacao.com/restaurants.html and en.sandsmacao.com/dining.html. Photo caption: The Venetian Macao will thrill visitors with live music and a spectacular countdown and fireworks show at midnight at its lagoon area on New Year’s Eve. Photo caption: The Parisian Macao’s Le Jardin is the venue for its New Year’s Eve party, with entertainment, firework, food and drink and giveaways.